Count these two nominations out — and most probably the lame duck period as having started. Photo by the Asamblea Nacional. Our country’s National Assembly never ceases to surprise us, just like the discredited courts, not to mention the presidency that believes itself to be a monarchy. This past week the tale is of the end of a tortuous road that the president’s two appointees of last December 15 had to run. Wasted — as have been public funds in all of his endeavors — were a valuable month and a half. The final result was that they were rejected in an unprecedented vote, with obvious political tinges that took into account neither the urgency of putting justice back on track nor speeding up government functions. We went from event to festival, trapeze-style, which by definition undertakes pirouettes of increasing difficulty above the trapeze while it is swinging. They tried to throw dust in our eyes in December because the Christmas holidays were coming. The lazy deputies ended their deliberations, but about the designation of two attorneys as magistrates of the Supreme Court of Justice they put on a circus of opinions and statements about how politically incorrrect the choice of these two ladies was, with the purpose of prolonging the special session. As has been recounted on various occasions, the two may have had their merits but the form and the substance of their appointments was what was questionable. 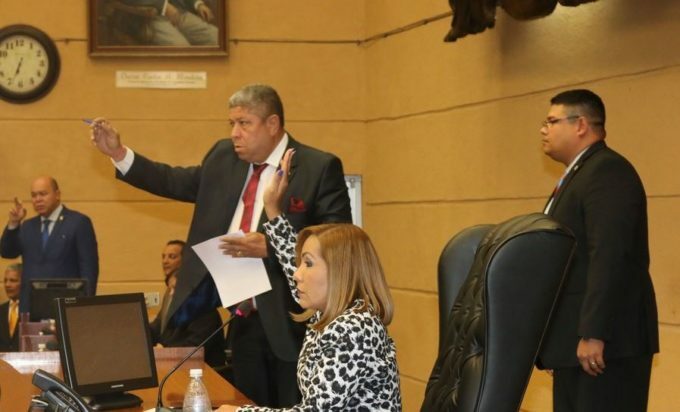 When they appeared before the plenum it was payback time, but this was surely the product of pressures to which the deputies had been subjected from the time that Varela had the ill-advised idea of imposing these women for the Supreme Court. I am not going to get into that manipulative game that the vice president played by making this a gender issue, that there was such opposition mounted because they were women. There is the touchstone — they were being used and the dignified thing under the circumstances would have been to decline the president’s appointment, which I dare not say was honorable. The entire country was witness to this manipulation. Instead of a debate about the nomination of two qualified people to try to rectify the Supreme Court that should have prevailed, the Varelistas, commanded by their boss, fell into politicking and dirty laundry. Those who had earlier been French kissing, who brought the current secretary general of the PRD to win that party’s internal elections in October of 2016, fought like muddy laundresses. It was a disgrace. They fell into depths of discredit, diatribe and recriminations like wounded and disgusted lovers. There is no reason for euphoria or celebration of this sweeping rejection of the caprices of the president and his brother. It is no triumph, notwithstanding that, for the first time, the caucuses were able to unite around criteria and vote in a disciplined manner. We have to see that at the bottom of it we are in the year before an election and that what motivates them is re-election. Just to be aware that one of these individuals will not face justice for having killed a child in a hit-and-run, that another doesn’t know the words to the national anthem (these in the happy world of Colon) and a third, in an attack of sincerity says that he deceived the entire electorate to be elected, ought to lead us to cry out that nobody should be re-elected. The political trapeze act is very fashionable in other countries and Panama is no exception. The Polish sociologist Zygmunt Bauman well said that “political parties are taxis in which certain characters are raised for convenience and later abandoned, sometimes being paid and sometimes not.” This thesis properly applies to the trapeze artist legislators — better known as the transfugas –- who consider the parties that clothed and supported them for a time as mere job opportunity franchises. But practical politics require congruity, without which there is no possible moral authority. This has not been learned by those who legislate from the Palacio Justo Arosemena, nor are they interested in learning it. What they see is how dilating processes that some at the moment criticize and collecting unwarranted pay for putting off votes in which they knew that the executive’s will would not be imposed, no matter how great the sums offered to vote in favor.